You think a homemade Mac and Cheese takes hours to bake? Think again! Creamy homemade mac and cheese is a comfort food classic the entire family will enjoy. Made using a pressure cooker, it’s ready to eat in less than 20 minutes! The secret to optimum flavor is in the cheese blend. This recipe uses both sharp Cheddar and Monterey Jack cheeses. A bit of onion powder, garlic powder, dried chives, and freshly ground black pepper add just the right amount of seasoning to create the perfect dish! Mix your family’s favorite vegetables, like broccoli or carrots, into the mac and cheese for additional nutritional value! Try adding a teaspoon each dried parsley and dill weed with the egg mixture for an herbal flavor boost. Per Serving: 996 calories; 74g fat; 28.5g carbohydrates; 54g protein; 268mg cholesterol; 1435mg sodium. 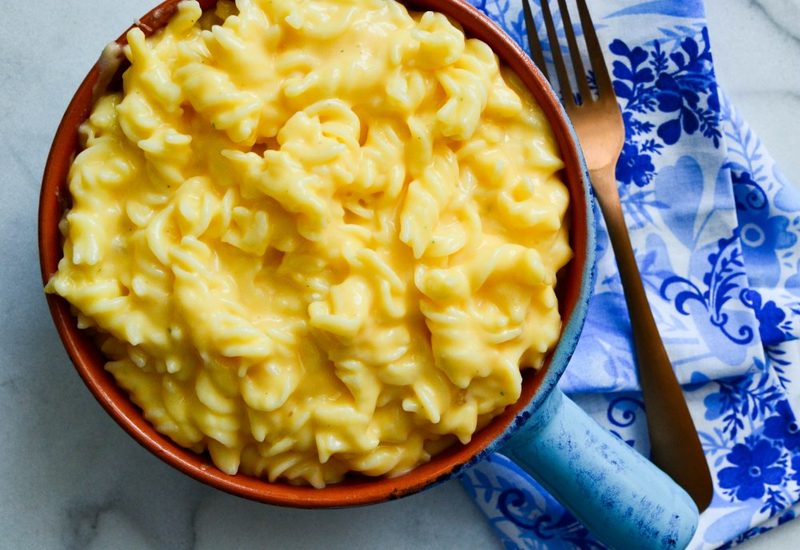 This mac and cheese is so creamy and delicious, our kids had second and third helpings! The only thing we substituted was the macaroni, we made it with gluten free noodles. The seasonings give it a cool, garlicky flavor, almost like ranch dressing mac and cheese. So good! This was my first time trying pressure cooker mac and cheese. I didn't use all the seasonings it called for, just salt, pepper, and a dash of paprika. This was a good recipe that is very family-friendly. I ate it up quick! I used gluten free pasta and added some broccoli. I cannot believe how fast this was and no dirty pots! I did shredded mozarella instead of jack and loved how creamy it was, also loved that it used almond milk! Love that I don't have to spend hours baking mac and cheese. This version is creamy and delicious. From start to finish this recipe took around 20 minutes to make. Can't beat that. I'd spend more time boiling water for instant mac. So glad I found this recipe. Four minutes was the perfect amount of time to cook the pasta noodles. I didn't notice but when I stirred in the Cheddar and Monterey Jack cheeses with the noodles my pressure cooker was on the Saute feature. They didn't burn or anything, it worked out well. I loved this recipe. It is really cheesy. I used regular milk and warmed up the milk a little before putting it in with the noodles. I don’t think I had to but it helped with the cheese melting. I added parsley and red pepper flakes just to heat it up a little. I think I might sauté some onions next time. If you follow this recipe it is quick and very easy!! I will make this again but might cut the recipe in half because it makes a lot and a little too much for two people. Love that the noodles can be cooked in my Instant Pot. I used wagon wheel noodles and shredded blend of three cheeses I had on hand. Turned out great. I’m going to add fresh vegetables next time. Noodles were cooked perfect but way too cheesy for our tastes so we will be changing that for next time. HELP! Okay guys what am I doing wrong? Anytime, I try to make a pasta recipe my pasta sticks to the bottom of the pot. Followed recipe to a T. Almond milk was overwhelming. Grossest mac n cheese I’ve ever had. Soo GOOD. Since only two we halfed the ingredients. That was my wife’s favorite. Even used regular milk.